Many of you have been anxiously awaiting news of BoomChik, the collaboration between Dave Smith and Roger Linn announced at Winter NAMM 2007. 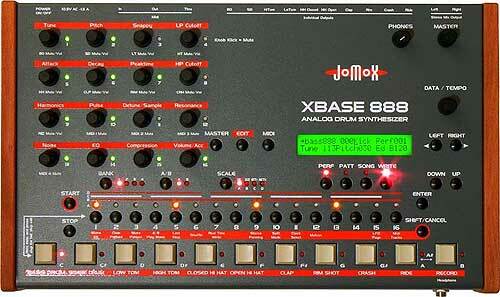 The most obvious development over the last year is that it is no longer called BoomChik: it is now the LinnDrum II. 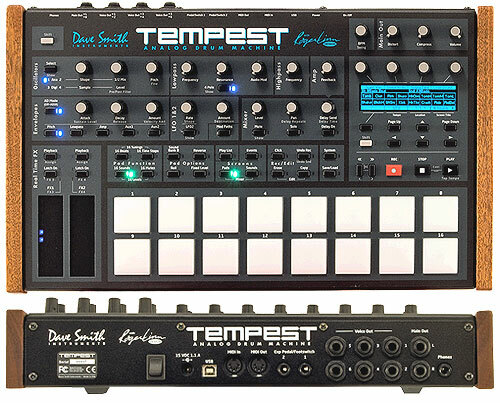 There will be two models: the all-digital LinnDrum II and the LinnDrum II Analog, which adds a 4-voice analog synth and 27 dual-function voicing knobs. The LinnDrum II will be available from Roger Linn Design and the LinnDrum II Analog will be available from Dave Smith Instruments. Operating system is optimized for realtime live performance, with the ability to switch between beats, drop in and out of record on different beats, switch in and out of song mode and much more, all without stopping play. Digital voices have nearly the same signal and modulation path--including modulated filters and resonators--as shown on the LinnDrum II Analog panel. Total number of voices is not yet determined. 16 standard 1.1 inch square velocity- and pressure-sensitive drum pads, assignable to sounds, tunings, beats, track mutes, sound mutes or sequence steps. 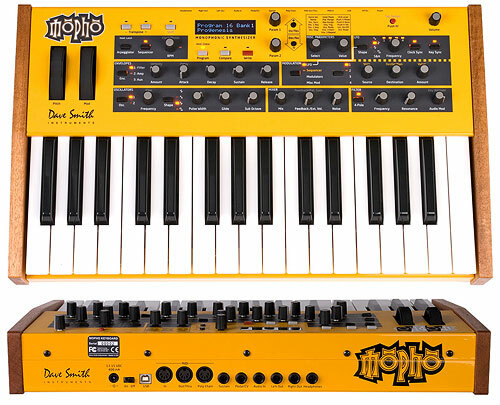 Both MPC-style real time and 808-style step recording are provided, and the 16 pads are backlit for visual animation. 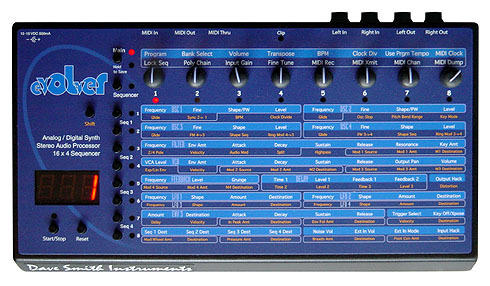 Real-time stereo digital effects on output mix--modulated multi-mode filtering, guitar amp model and bit/sample rate reduction distortion, modulated resonator, compressor, delay, reverb and EQ--with 6 dedicated on/off keys to switch them individually in or out in real time. Compact flash slot for data save/load/backup, or for expansion of internal sound storage. Internal RAM and flash size is yet to be decided; at least 16 mbytes for each. 128 x 64 dot graphic LCD. USB port for transferring samples and other files, MIDI messages and audio I/O to and from computer. 4 pushbutton soft knobs below the LCD, acting either as soft knobs or soft keys. 48 lit buttons for extensive real-time performance control. 2 sliders assignable to a large variety of real-time functions. HELP key gives descriptive text for any screen, data field, function key or knob. Pressing DETAILS key followed by any panel key presents a screen of settings related to the key pressed. 2 pairs of stereo outputs, with phones output fed from either pair. 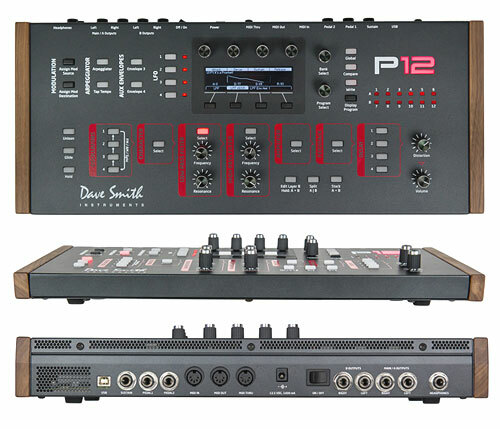 Stereo inputs for sampling, audio processing or triggering sounds. 2 inputs for either foot switches or expression pedals, assignable to a wide variety of functions. 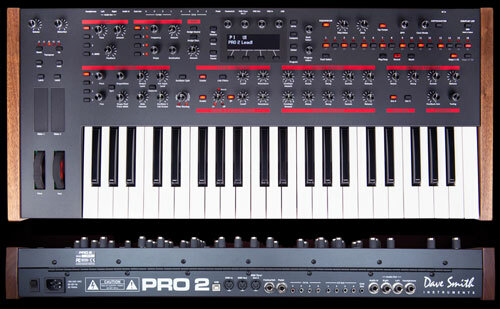 Four complex analog voices based on the same Curtis-chip synth voices used in the highly-aclaimed Prophet '08 and Evolver keyboards. 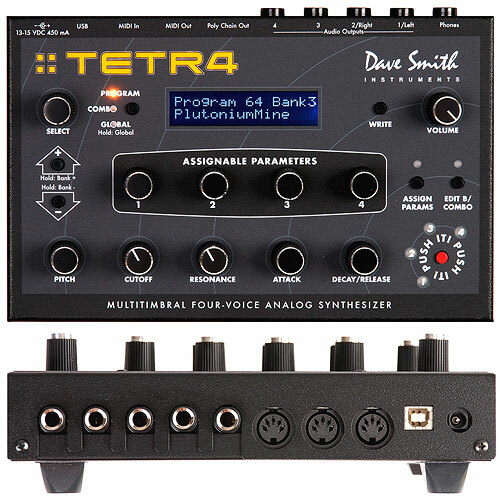 Four direct ouputs for the four analog voices. 27 dedicated dual-function rotary encoders for voicing the analog and digital voices. This product should be shipping by the end of 2008. 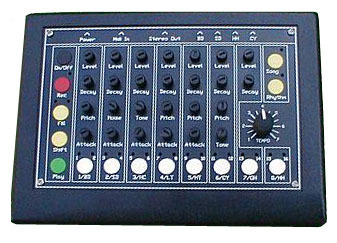 For the most up-to-date information, visit www.rogerlinndesign.com/products/linndrum2/.